The ideal favor for your rose or floral-themed event, these unique white rose bottle stoppers are truly a one-of-a-kind gift for your guests! Each bottle stopper is constructed of a sturdy chrome base wrapped with a black rubber gasket. An exquisite white resin rose with faux pewter leaves and stem and a glimmering rhinestone center tops each favor. 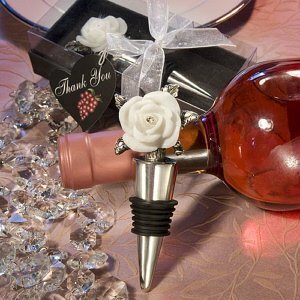 The bottle stopper measures 4" by 1" by 1 3/4" and is individually packaged in a clear box with black base, white organza ribbon, and wine-themed thank you tag.